The British and Irish Lions could have whitewashed world champions New Zealand 3-0 had they been better coached, says flanker Sean O'Brien. The Irishman started all three Tests of the 1-1 drawn series. And he believes poor coaching prevented the Lions securing a historic victory. "If we had a little more structure during the weeks, and more of an attack gameplan, driven way earlier in the tour, I think we could have won 3-0," O'Brien said. "With the players we had, we should have won the series." 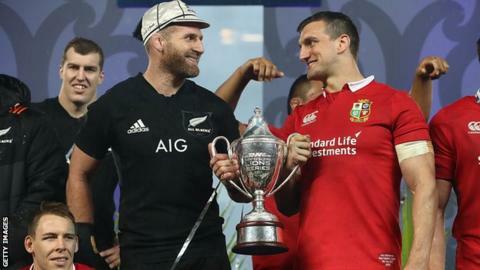 Lions chief executive John Feehan responded by saying the squad "had the best coaching team available" and achieved "a remarkable result" in New Zealand. Feehan added: "People will always have their views on what could have been done better but the fact is that, against all the odds and with limited preparation time, this squad became only the second Lions team in history to either win or draw a series in New Zealand in 13 attempts. "That achievement cannot be underestimated." Speaking immediately after the drawn third Test in July, Lions coach Warren Gatland said: "Given the schedule, given how tough the tour was, to come to New Zealand and get a draw you've got to be proud of that." The BBC has approached the Welsh Rugby Union for comment. As well as criticising the preparation before the first and third Test matches by Gatland and his staff, O'Brien was especially critical of attack coach Rob Howley. The 30-year-old said the midfield pairing of Johnny Sexton and Owen Farrell were "running our attack shape" by the end of the tour. "The coaches have a lot to answer for in terms of our attack rather than Johnny and Faz trying to drive it," said O'Brien. "If I was being critical of any coach it would be the fact that I think Rob struggled with the group in terms of his attributes of trying to get stuff across whereas Johnny and Owen drove everything the second week, for instance, in our attack and had a better plan in place. "So I don't know if it was people not buying into what he was about or whatever else. "That's the hard thing about a Lions tour as well; getting everyone to listen to a coach that was probably set in his ways." As well as assisting Gatland on the Lions tour, Howley works under the New Zealander in the Wales set-up. Scotland head coach Gregor Townsend and Glasgow assistant Jason O'Halloran both turned down invitations to be part of Gatland's Lions staff, and O'Brien - who also toured in 2013 - says the best coaches must be recruited in four years' time. "Coaching-wise they need to make sure they have the best coaches in the best positions - attack, defence, forwards, whatever it may be on a Lions tour," he said. England back row Billy Vunipola, who missed the tour through injury, told BBC Radio Four on Thursday that England coach Eddie Jones would have been able to guide the Lions to a series win. "This is a bit of changing room talk that has actually surfaced for the first time I guess in rugby terms. I wasn't there on tour," said Vunipola, whose brother Mako played in all three Tests. "I guess if he (O'Brien) is saying it and the authority he said it with, he's probably right. "For me to sit here and say they probably would have won is wrong. But personally my opinion is that if Eddie (Jones) went they would have won 3-0. He is that good. "I don't know how he would have done it, but he would have found a way."